Swiss Screw machining is the ideal method for manufacturing medium to high volume cylindrical components with a relatively small diameter. While most turning operations are performed by supporting the workpiece at its ends, Swiss machining differentiates itself by supporting the part through the use of a guide busing that is located very near the cutting tool. Because the distance between the support of the workpiece and the cutting tool is kept to a minimum, the bending moment experienced by the workpiece during the machining process is much lower than in traditional turning, virtually eliminating deflection at the cutting surface. Our Swiss Screw machining equipment can accommodate parts up to 32mm (1.25”) in diameter that are made from any range of metal or plastic materials from standard Aluminum, Brass and Stainless Steel Alloys to exotic engineered alloys, such as Titanium, and plastic resins, like Delrin®. Our machines have magazine style bar feeders that can hold rod stock up to 12’ in length, allowing for continuous operations and maximizing machining efficiency. Once set up, the bar feeders keep production running with minimal operator interaction. Additional features such as high pressure coolant pumps facilitate high speed machining, deep hole or gun drilling and increase the level of precision that can be achieved. Also, twin spindles and live tooling allow us to create multiple part features, such as parts with flats and cross holes, in a single cycle. This versatility eliminates most secondary operations, which in turn reduces the cost of the overall part. Ardel Engineering & Manufacturing is willing to offer and manage turnkey complete parts and assemblies using our certified subcontract vendors for plating, heat treating, part marking, hardware, and more. 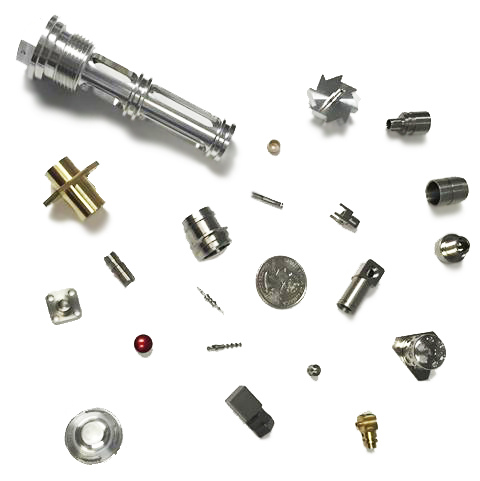 We are confident in our ultra-precision capabilities and our ability to create the right CNC custom part for your application. Let us help you with your next project. For more information about Ardel and our Swiss screw machining processes, please contact us today.